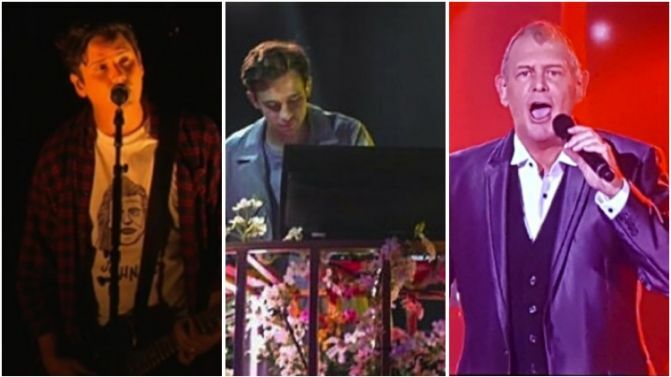 The credits have rolled on the ARIA Awards for another year, leaving behind them a trail of earth-conquering winners (AKA Flume), bitter, social-media savvy losers (we’re looking at you, Ball Park Music) a dash of controversy (King Gizzard & The Lizard Wizard’s win in the Hard Rock/Heavy Metal category) and a whooooole lotta hangovers. But as well as gifting Australia with a new batch of prize-winning artists, the 30th annual ARIAs also yielded plenty of memorable performances. Homegrown artists from across the generations took the stage at Sydney’s The Star (some twice after failing the first time — *cough* Veronicas *cough*), but inevitably, some were more memorable than others. Catch our picks of the top five performances from the 2016 ARIA Awards, below. Prior to buggering off downstairs to smash a few cold ones and almost missing their ARIA Award for ‘Best Group’, Mansfield’s finest Violent Soho filthed up the stage with some garage grunge goodness in the form of their WACO cut Like Soda. Extra points to frontman Luke Boerdam for his extra roof-raising rasps. Flume not only bagged more awards than anyone else last night, he also proved why he deserved them all, showing off his tekkers in the DJ booth with renditions of two of his biggest Skin cuts, Never Be Like You and Say It, featuring live string and horn sections as well as OG featured vocalists Kai and Tove Lo. Jimmy Barnes and Jessica Mauboy kicked off proceedings with a rendition of Barney’s classic INXS collab Good Times. Not only did the pair bring down the house with their equally massive pipes, their performance made a powerful opening statement about the spirit of the evening, with its message of positive vibes and a celebration of Aus music across the generations. It also felt extra significant, with the 20th anniversary of Aussie rock icon Michael Hutchence’s death just around the corner. Closing out the festivities was the one and only Farnsy, wrapping his legendary pipes around the eternally iconic Aussie anthem, You’re The Voice and leading a massive ARIA-wide singalong, bagpipes and all. ‘Nuff said. A dream team of Aussie all-stars united to toast icons Crowded House with a musical tribute following their ARIA Hall Of Fame induction. After a spine-tingling rendition of iconic gem Fall At Your Feet from Missy Higgins bleeding into a tear-jerking performance of Better Be Home Soon by Powderfinger’s Bernard Fanning, Crowded House themselves brought it all home with a show-stopping performance of their 1993 hit Distant Sun. Not a dry eye in the house.